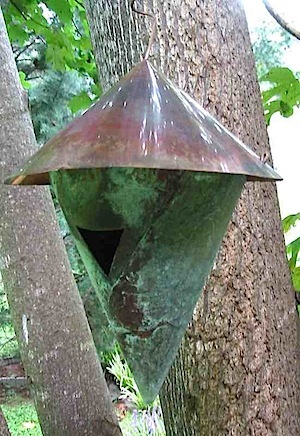 Songbirds can be attracted to the smallest of spaces… with the right stuff! Elements found in nature are always best for birds; plantings that produce a food source and fresh water, they just can’t be beat when it comes to helping wild birds thrive. 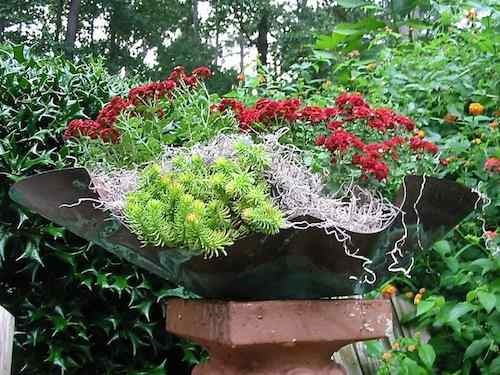 Our hand made birdbath & planter lets you combine those elements in a stunning fashion. Whether your yard is monstrous or miniscule, you can create a one-stop oasis by planting for the birds and offering a fresh water source in one. Equally suited for deck, patio, or balcony, it’s ingenious! 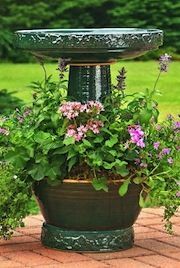 Nectar producing flowers like petunias, lantana, salvia, and impatience work perfectly in the generous planter bowl, and it’s very likely that hummingbirds and butterflies will frequent these flowers for a quick meal. The bath itself is glazed inside which helps water stay cooler. Adding a few river rocks or decorative stone makes the pool even more inviting by offering easy spots to land and perch, especially for fledgelings and juveniles during spring. Adding them will also help trap sediments at the bottom of the bowl. But when temperatures really start to heat up, water should be changed every other day. Because that’s the trick… if you keep it fresh – they will come! In brilliant blue, green or turquoise, this bath and planter set packs a big punch for a small space. Beautiful glazed pottery, colorful annuals, and vibrant birds of spring and summer! What gardener could ask for more? Another birdbath set worth mentioning features a bee skep, although strictly decorative. 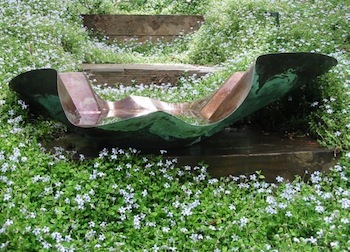 The bath is actually hand painted, and the large pottery skep makes for unique garden sculpture. Now, about that special Mother’s Day gift – there’s no way you forgot mom?